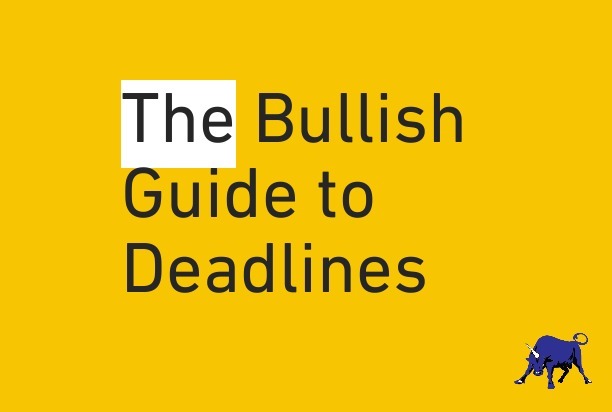 Bullish: Behind On A Deadline? Read This. Are deadlines chasing you like fiery hell-demons? Do they thump from under the floor like Poe’s tell-tale heart? Do they watch you like the all-seeing eye of Sauron? If you have an impossible deadline, here’s a quick read (it should be – you have a deadline, right?) with a few ideas, and some important questions to ask. Why does the deadline exist? Many of us are still thinking like schoolchildren. This paper is due on Tuesday because Mrs. Horvath said so and if you don’t do it you fail. Deadlines in the working world are only sometimes like that. I often respond, “Wednesday,” or “Two weeks from Friday.” Sometimes these are real deadlines, but sometimes I just randomly pick days that things could be due on! I would hate to think someone pulled an all-nighter for one of those. So, if a writer asked, “Could I get that to you next Monday instead of this Thursday?”, on at least half of occasions, I would say, “Sure.” And then I’d get the added bonus of feeling like a nice person without having to do anything. If presented with a polite version of, “You can have it on Wednesday, but we’ll be able to pre-empt a lot of problems if we give it another two weeks to take X and Y into account,” such people will often choose quality over speed, since the deadline was really just their version of yelling, “Push!” at a woman in childbirth because they think that’s somehow supposed to help. Can you re-engineer the deadline? Ideally, you don’t want to be in a situation where there’s a totally authoritarian boss, and the boss sets deadlines, and you obey them or else you fail and are punished. That’s like spending the rest of your career in the tenth grade. It’s not compatible with thoughtful and creative work. Imply that the original deadline was based on faulty or incomplete information, which is often the case. Note: It’s a lot easier to pull this off if you possess rare, valuable, and quantifiable skills, which is why I always stress going “into the cave” and developing expertise. 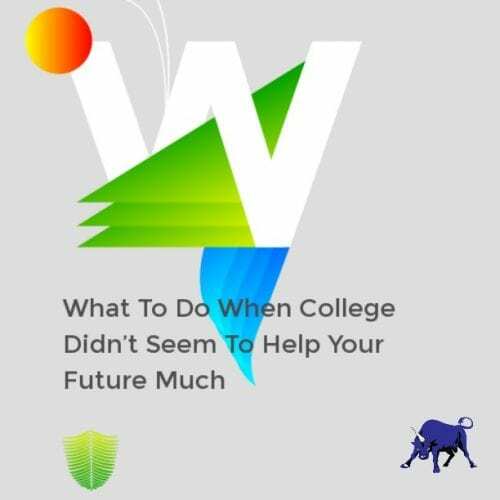 (Bullish: Tech Skills Are Not Optional for Your Career, Bullish: How to Sell Yourself as an Expert, and Bullish: Using Your College Skills to Succeed After College.) Information is now free; not taking advantage of it is just laziness. 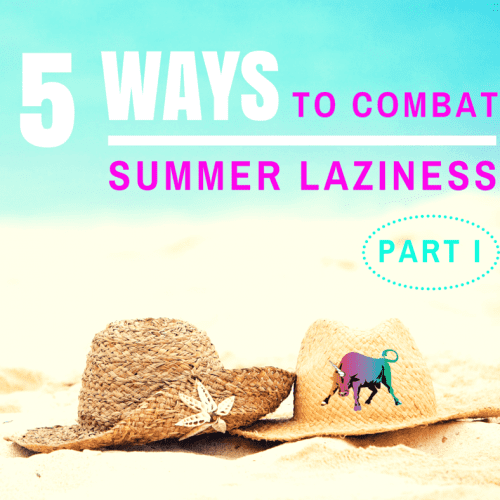 I don’t write articles for lazy people, because I don’t care about them. What does the person receiving your work actually expect? My paradigmatic Bullish column is about 3,000 words. Most readers, I think, would be happy with about 750. You don’t have unlimited time to read these, right? When a deadline looms, it helps to write the article I think you would most want to read, not the one that I’ve held deep in my heart for years and can articulate only after drinking two bottles of wine and reading three related books on the topic. Similarly, when I ran my dot-com, I often procrastinated about writing proposals. My proposals were fifteen-page-long, glossy affairs full of promises and buzzwords. I often completed them two weeks later than would have been ideal, and then FedExed them over. It usually failed to result in a sale. I then discovered that one of my competitors was sending out same-day proposals. These “proposals” consisted of a form letter on which they would scribble “Web Advertising Campaign – $15,000.” Then they would fax it. I’m not sure what the clients were expecting, but I think the four-word (is “$15,000” a word?) fax proposal would be fine if it followed up one of those two-hour lunches where everybody got on the same page. A two-hour lunch is a lot more fun than writing a proposal, anyway. Was your vision for the work way more than what was really needed? Purge your mind of your original plan and imagine the person receiving the work. What is the fastest way to make that person happy? You may find that your original vision had more to do with expressing yourself and making the world in your image than it really did with getting the job done efficiently. Some of us assume this is cheating; it usually isn’t. 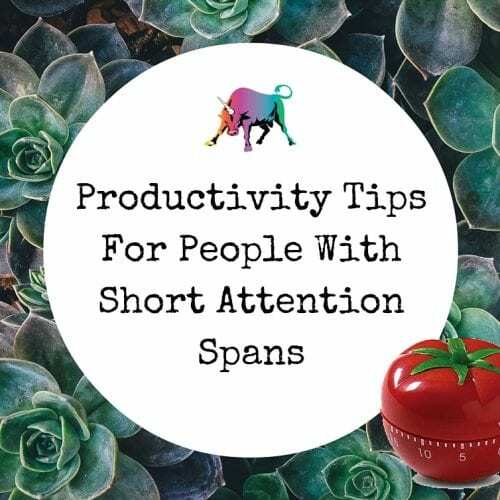 If you asked for help on a deadline, would people think you’re asking them to do your work, or would they be excited to get involved? People a level down might be excited to get involved in something a level up. People a level up sometimes feel flattered to be asked for their expertise. Can you crowdsource your work and walk away having everyone think you’re a genius? This obviously won’t work for everyone in every situation. But a great many work products in our information-based society are kind of unnecessary one-way conduits of information. In most cases, the information presented will not even result in direct action, as the people who get to make the decisions don’t usually have to write proposals or make presentations about it. So, why not crowdsource? People love to get their own two damn cents in. Earlier this year, I signed up for a class that was eight hours long, once per week. How do you fill an eight-hour class?! Well, each class opened with every person in the class discussing his or her progress over the previous week. That took an hour. Then we took a break. The instructor didn’t do much during this part. Plenty of “classes” are largely discussion-based. Similarly, could your “presentation” be an interview? Show up with some questions on slides or an iPad so it looks like you prepared more than you did. Then, faciliate a discussion. That’s much better than watching someone (DIE DIE DIE) read their Powerpoint presentation. Could your “proposal” be an interactive process where you pull up a template on your laptop, type some bullet points as the client explains what they want, ask the client if your price is acceptable, allow the client to remove bullet points in order to adjust the price, and then you email the proposal to the client? Doesn’t that actually sound like a much better sales technique than sending some glossy piece of work that sits on the client’s desk along with all the other ones? The harder thing is not necessarily better. Paul Ford posed that the fundamental question of the Web is “Why wasn’t I consulted?” For people steeped in the world of social media, it does seem like many more work products should become a two-way street. If this saves you some work and gets you recognized as a visionary – well, that’s pretty badass.